Concealer Tutorial: Look Like You’ve Sleep 9 Hours! I Promise! 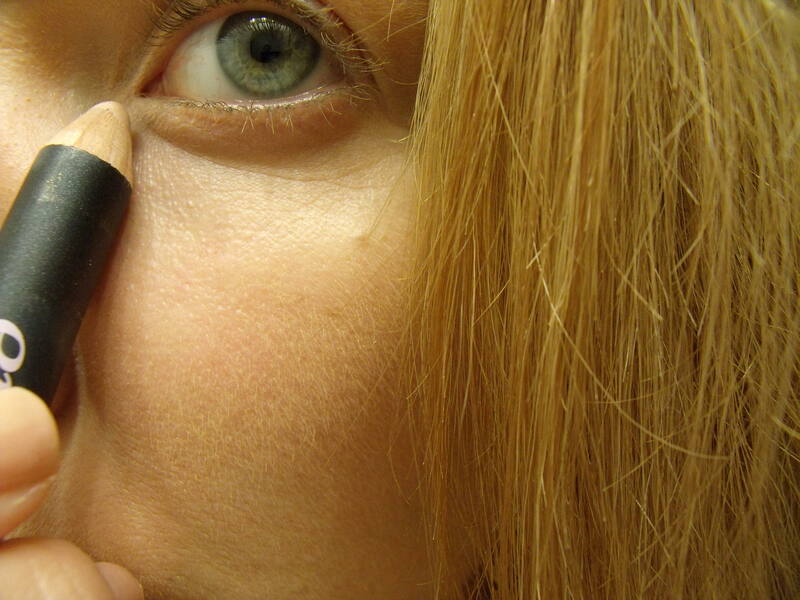 This is the kind of concealer technique you can use on those mornings where you’re already so tired and you just got out of bed. We’ve all been there, right? So depressing. 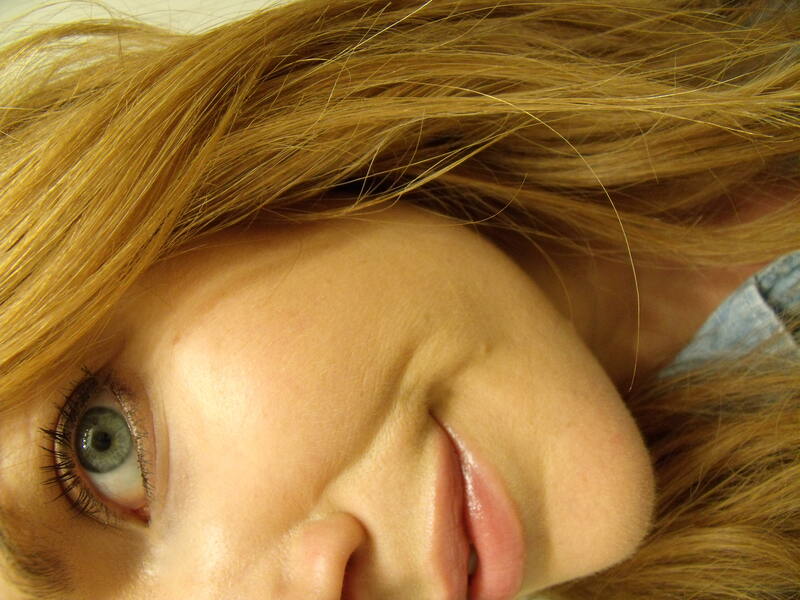 But this concealer technique will brighten your face and help you have a better day and life. That’s a Girl Get Glamorous Guarantee. The products I’m using are: Boots – Protect and Perfect eye cream, Cargo – One Base concealer, Amazing Cosmetics – Amazing Concealer, Make Up Forever – HD powder, Benefit – High Beam, and Benefit – Eye Bright pencil. 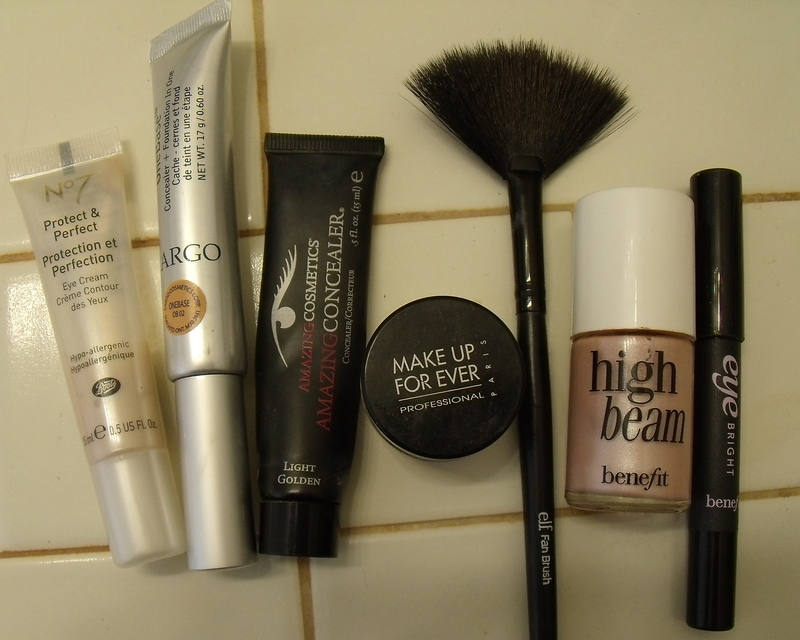 You don’t have to use these specific products, I’ll say why I use each of them in the steps section and then you can look through your own makeup to see if you have something that gives similar results. Step 1: Use an eye cream that specifically says it brightens. 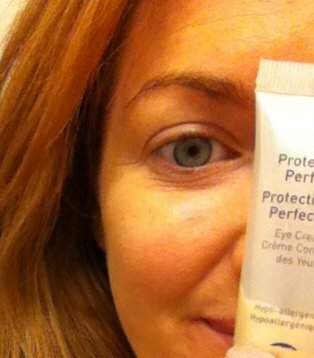 I like Boots Protect and Perfect eye cream. It it slightly luminous, without being full on shimmer. Dot this all around your eyes and give it a minute to sink in. 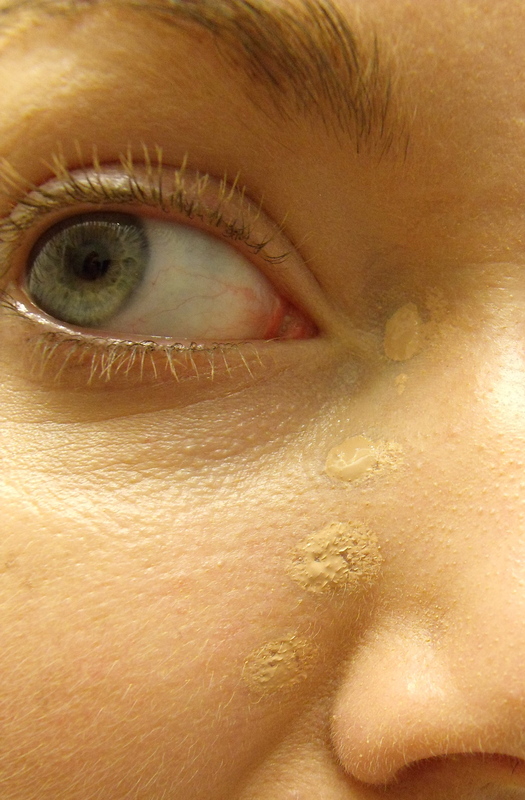 Do this step before you apply your foundation. Step 2: This step comes after you have applied foundation. Using the Cargo One Base Concealer, or any concealer that doesn’t settle into fine lines, makes dots starting on the inside of your eye, below your eyebrow, and curve the dots under your eye to the outer edge. Blend by patting with your ring finger. 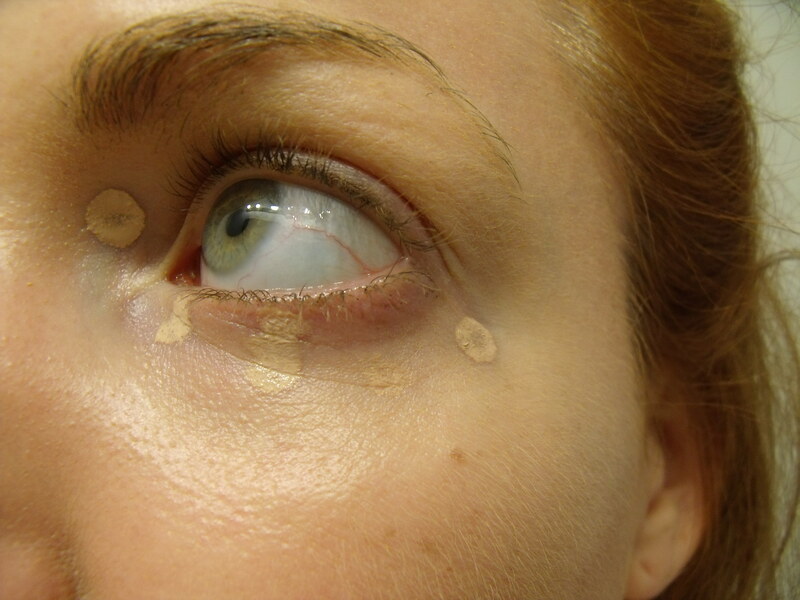 Cargo One Base concealer dotted in inner corner and beneath the eye. 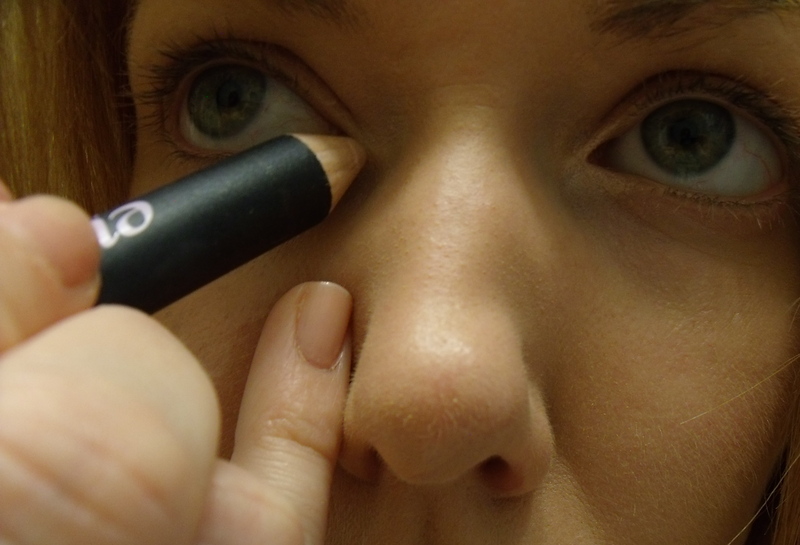 Step 3: Using the Amazing Cosmetics concealer, make four dots starting at the inside of your eye directly down to the outside of your nose. Patting this also with your ring finger, blend it in completely, spreading it onto the top of your cheeks, but being careful not to get it near any fine lines. I love this concealer for it’s coverage, but I do feel like it can pool in fine lines, making them stand out more. This is the one product though that I say go ahead and buy this specific one, because for this concealer technique, it does work the best. It’s pricey, but it’s so concentrated, you just use a tiny dot each time and the tube will last you forever. The magic is happening, my friends. Amazing Concealer after blending, down side of nose and over top of apple of cheek. 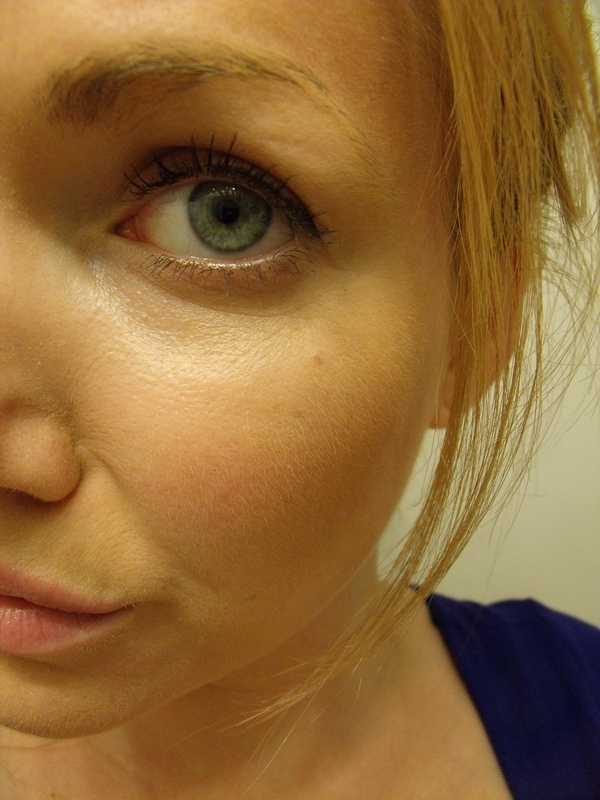 Step 4: Lightly, and I mean suuuuper lightly, using the fan brush, dust over your eye area with some powder. A light dusting of powder will set your concealer for the day. If you go too heavy, though, it will take away the glow that you just created and make your under eye area look flat. Sorry if any of this comes off as too “know-it-all annoying big sister.” I just want you to look pretty. If too much powder made the area look flat, or if you need slightly more dark circle coverage, repeat step 2 over the powder. 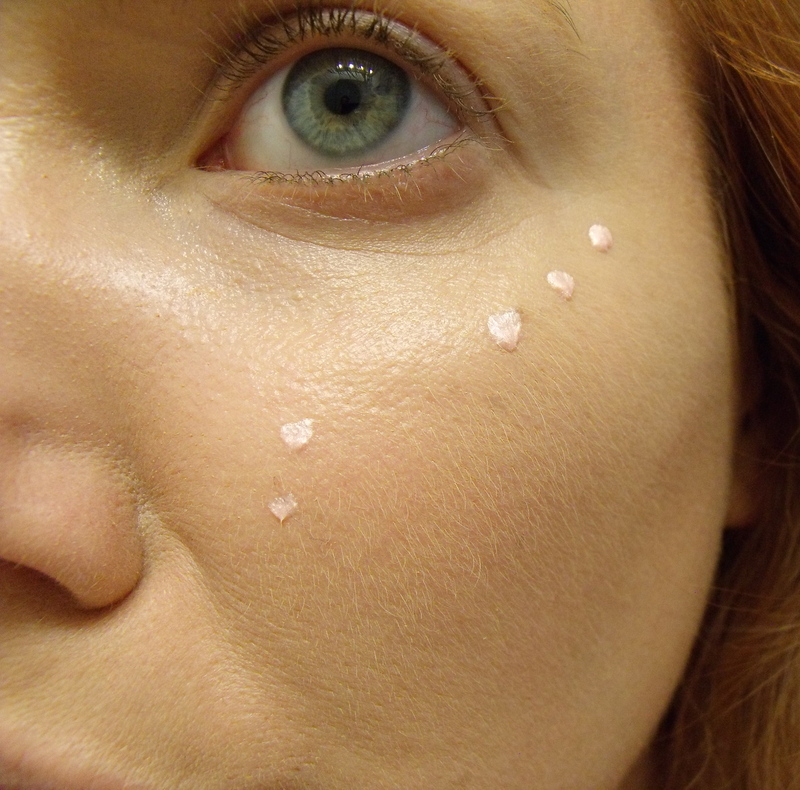 Step 5: Dot Benefit High Beam in tiny dots on your cheekbone and two tiny dots above the apple of your cheek. Blend completely. 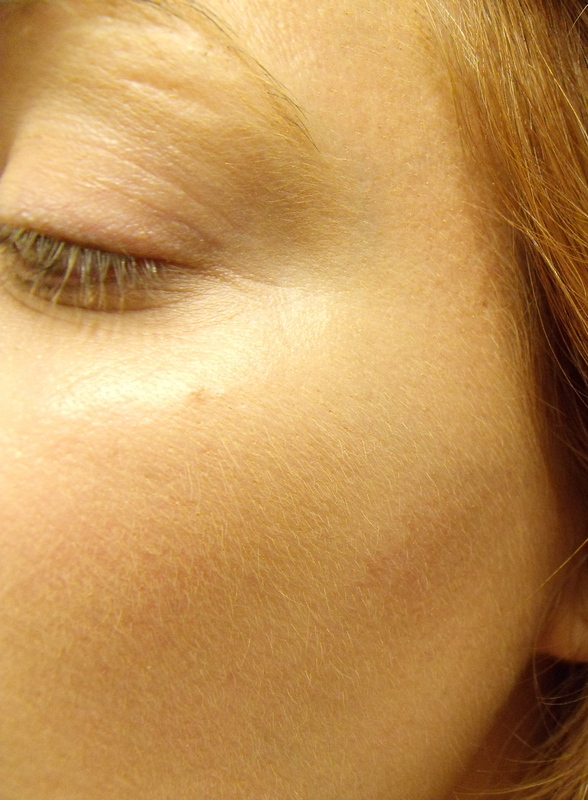 5 tiny dots of Benefit High Beam. Step 6: Using Benefit Eye Bright (or a tiny dot of High Beam on your finger if you don’t want to buy two products), draw a small “V” at the inside corner of your eye. Blend again. Draw a “V” around the inner part of your eye. On both sides, duh! 🙂 Draw the “V” then blend away. All finished! Your dark circles are hidden like every photo of me wearing a tube top in college. 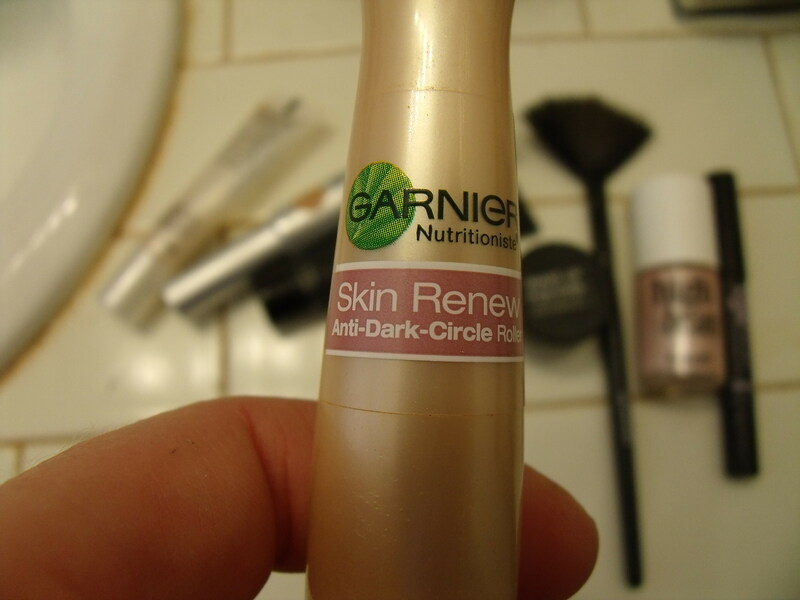 Time crunch version: If you are super crunched for time, I have found that the Garnier Skin Renew Anti-Dark-Cirle roller ball eye wand in the Tinted color also works really well at covering up dark circles quickly. You won’t get the same amount of coverage, but it will get the job done in about 10 seconds! Roll it underneath your eye and pull some of the color up into the upper inner corners of your eyes. Also, roll down the sides of your nose and blend it out to the tops of your cheeks. 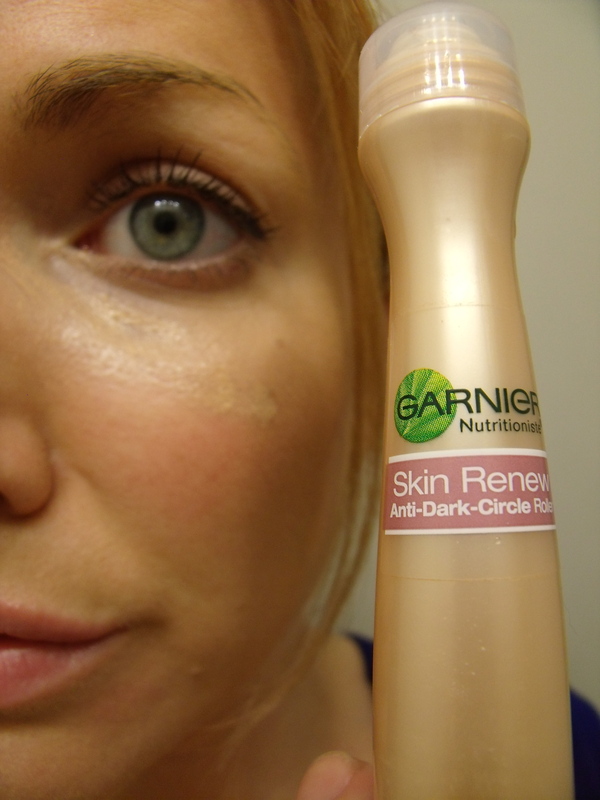 Garnier Eye Roller. This is a hot deal for about $13. Not as full coverage, but amazing stuff if you are short on time. IE: doing your makeup in the parking lot at work. I used to keep one in my purse and would use it to touch up my concealer everyday around 3 or 4 pm, when you start to look and feel exhausted. It’s such an awesome and easy way to touch up your makeup and it is so light it doesn’t make me feel like I have layers of makeup on. But it kept leaking in my purse 🙁 , so now it stays at home. Thank you for reading. Let me know what you think after you try this technique. I appreciate it and love all your comments and feedback! My New Hair Extensions – Photo Shoot Pics! Thank you! I need to buy a fan brush and High Beam. Never knew that adding a bit of concealer along the sides of the nose and moving it out across the tops of my cheeks was a thing! Crazy right? The first time I tried this technique I couldn’t believe my eyes. It makes a big difference! Also, eyeslipsface.com has fan brushes for $3. You can also find this brand at Target in West Ho I think.